When you arrive in Chester town centre, the first thing that strikes you is how different this town is to other English towns. 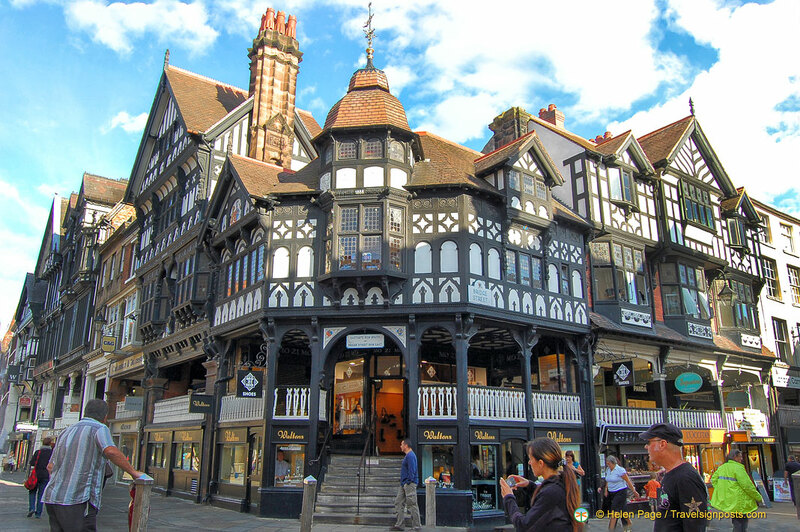 One of Chester’s most impressive sights being the Rows is there to greet you – the two-tier shopping galleries which date from the Middle Ages. Chester is a magnificent heritage city established by the Romans over 2,000 years ago. When the Romans first settled here in AD79, they established a fort to defend the fertile land near the River. And so it is that Chester today has the largest stone-built Roman amphitheatre in the country, a magnificent ancient wall that encircles the city, moats and much more. Many of Chester’s attractions are located in and around Chester city centre. Its four main roads, Eastgate, Northgate, Watergate and Bridge, follow routes that were laid out almost 2,000 years ago. The main streets of are lined with timber buildings, however the decorative timber-work that we see today are mostly 19th century. The Rows were first built in the 13th and 14th centuries. With their two levels of shops and upper gallery, it seems that multi-storey shopping centres were thought of many centuries ago. The Rows are most attractive near the junction where Eastgate Street meets Bridge Street. From here, the views of the Cathedral and the town walls give the impression of a perfectly preserved medieval city. The very ornate Eastgate Clock is apparently the second most photographed clock in Britain after Big Ben. Chester Market, next to the Town Hall, provides undercover shopping in the heart of the city, following a tradition dating back to the 14th century. There are over 70 shops in the market and you can find just about anything you may need from clothing to shoes, fruit and vegetables, food, tarot cards, etc. Chester Cathedral is on the other side of Northgate Street. The Cathedral stands on a site on which there’s been a church for over 1,000 years. This magnificent building has been the Cathedral of the Diocese of Chester since 1541. Originally it was a Saxon Minster which was then rebuilt as a Benedictine abbey. The cloisters and church form one of the most complete medieval monastic complexes in the country. Check out the intricately carved choir stalls which are approximately 800 years old and the magnificent stained glass. 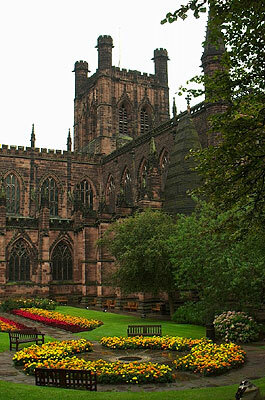 St. Werburgh, patron saint of Chester, is buried in this Cathedral. Chester is believed to be one of the best preserved complete walled cities in the British Isles and one of my favourite activities here is the walk along ancient Roman Walls. Take the steps up to the wall at Eastgate clock and you’ll get a great view of the streets. This is also a good place to start your walking tour of the city. You can pretty much circle the entire city centre by walking the Walls. Along the Walls you will come across towers and gates such as the King Charles Tower and Water Tower, and the plaques along the route tell you a little history of the gates and towers and developments since Roman times. Time permitting, you could do a cruise on the River Dee which will give you a different view of the city. And if you are staying in the area for a few days, you could explore the country houses and gardens of Cheshire, including Chester Zoo, the largest garden zoo in Britain. Chester is of course famous for its races and there’s also great opportunities here for shopping or going on food trails.